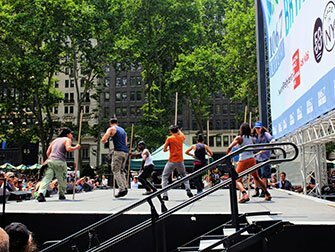 Broadway in Bryant Park is a free summer event where hits from the most popular Broadway musicals are performed. Both on- and off-Broadway shows are represented at this event, which takes place on Thursdays from 12:30 until 13:30. You can hear hits from Chicago, The Band’s Visit and Frozen, among others. The stage is located on the Bryant Park Lawn, the large grass area in the centre of the park. If you’re on time, you may still be able to get one of the famous green chairs. If not, you can just sit and relax on the grass. 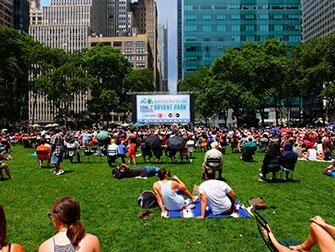 The event will take place around lunchtime, so grab something to eat and enjoy a leisurely lunch break during a day of sightseeing in New York! 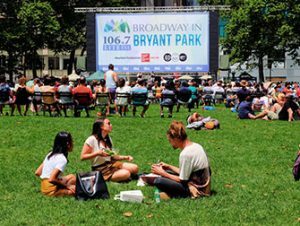 Eric’s Tip: During the summer there’s a lot to do in Bryant Park. If you don’t have enough time during the day, maybe you can go and see one of the free movies at night. Bring something to eat and drink and enjoy a night out in the open air!